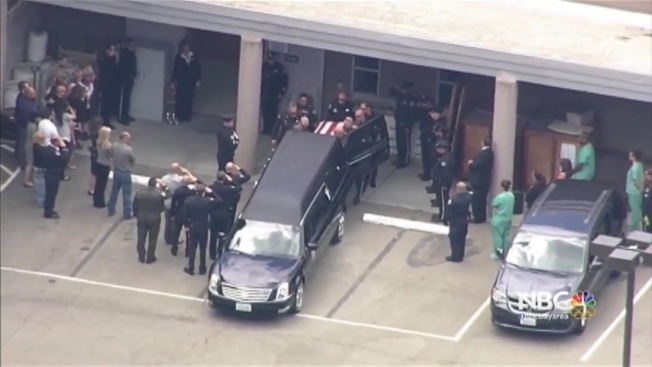 Dozens of police vehicles lined the streets of the South Bay on Thursday as officers from several agencies paid their resects to fallen San Jose police Officer Michael Katherman. Katherman's family arrived at the medical examiner's office to claim his body, which was then escorted to a funeral home in Los Gatos. Along that route, other officers and first responders stood at attention and saluted as the procession passed. Katherman, 34, an 11-year veteran of the force, was killed in the line of duty Tuesday after his motorcycle collided with a minivan. Katherman's death has touched all public safety personnel. Katherman was in a casket draped with the American flag carried by a handful of officers, who placed him into a hearse from the Santa Clara County medical examiner's office in San Jose just before 1 p.m.
Fifteen police motorcycles led the procession that also included numerous police cars along a route that went down South Bascom Avenue and East Hamilton Avenue in Campbell before continuing south on Highway 17. The roughly 20-minute procession ended at the Darling & Fischer Chapel of the Hills funeral home in Los Gatos. Wives and families of other first responders also were present to offer a final tribute. "This is the worst nightmare for any wife of a first responder," said Janet Yost. "It’s tough. You always assume you’re going to see them at the end of the day, and this is the reality, that sometimes bad things happen." The memorial at police headquarters in San Jose contiued to grow as a steady stream of people stopped by to pay their repsects, leaving flowers, notes and candles around a motorcycle that served as the centerpiece. Katherman's funeral service is scheduled for 11 a.m. Tuesday at SAP Center in San Jose.